MSIG recently marked its 10th anniversary in Vietnam with a two-day celebration, attended by over 500 partners, customers, and staff. The celebrations, held March 11 at the Sheraton Hanoi Hotel and March 12 at the Hotel Nikko Saigon in Ho Chi Minh City, were graced by guests of honour Phung Ngoc Khanh, director-general of Insurance Supervisory and Authority, Ministry of Finance; Kunio Umeda, Ambassador of Japan in Vietnam, and Junichi Kawaue, Consulate General of Japan. Noriyuki Hara (pictured), president and CEO of Mitsui Sumitomo Insurance, flew in from Japan. MSIG has been doing business in Vietnam for 25 years, beginning with a representative office in Hanoi in 1994. In 2009, a subsidiary office, MSIG Insurance (Vietnam), was established. The company began by supporting Japanese corporate clients, then later branched out to serve the general public and develop its bancassurance channels, a statement from MSIG said. 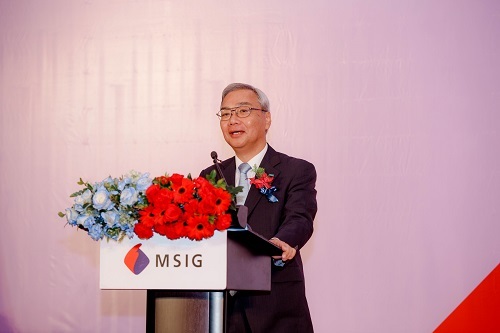 During the celebrations, Vietnam’s Finance Ministry awarded MSIG with a ‘certificate of merit’, recognising the company’s efforts in contributing to the development of Vietnam’s insurance industry from 2009 to 2018.